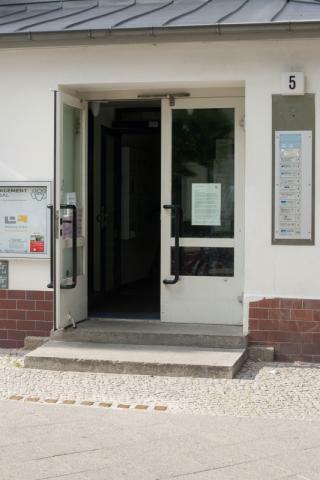 Entrance to the building at Trautenaustraße 5 in 2012, with nine Stolpersteine in the sidewalk out front. The two newly unearthed death records (see earlier posts) of our Wohlgemuth ancestors are not earth-shattering since we already had the closely related burial information for Isaak and Betty. Yet we pick up all kinds of additional clues studying the official registry office death records, especially manifestations of the Nazi persecutions that Betty endured in her final weeks and days of life. When I visited Berlin last summer, the Zentrum Judaicum archive had burial information for Betty that revealed substantial details about her death, most especially that her cousin Amalie Katz, previously unknown to us, was the one who reported the death and arranged for her burial at Weißensee cemetery. Since then, I have learned more about Amalie, including her deportation from Berlin in August and death at Treblinka in September 1942. There was also a detail about Betty's place of death, which was not at her home but at a clinic located at Trautenaustraße 5, that I did not pay much attention to at the time. Now that I Google that address, I find that it is a well-known Stolpersteine site, with nine stones laid for Jews who were listed at the clinic address in a 1939 census and later perished in extermination camps. From the above link, we learn that in 1942, presumably after Betty's death in February, the building ownership was aryanized in a forced sale to a Gestapo-backed real estate operator Curt Pelny. Pelny is not super well-known but there are some interesting sources on him that I will translate and look at later. From Betty's record, we see that the Jewish clinic at Trautenaustraße 5 was still operating at the end of February 1942. We can infer that Betty had previously been a patient at the clinic. Her causes of death are Magenkrebs, stomach cancer, for which she must been treated for some time, and Herzschwäche, heart failure. The clinic was located only about five blocks from her apartment in the heavily Jewish Bavarian district. I had thought Betty's Aschaffenburger address would be covered by the Berlin-Schöneberg registry office but it turned that her death was recorded at the adjacent Wilmersdorf office. Lucky for me that the Landesarchiv checked both Standesamten, since I had mistakenly specified Schöneberg. I don't know if the ailing 67-year-old Betty Wohlgemuth was still able to get around in her last weeks. If she was, the clinic at Trautenaustraße was within easy walking distance. By that time, she may have been admitted as a in-patient due to her declining condition. No doubt her cancer was getting worse, and when she finally expired it was due to heart failure. As mentioned, it was Amalie Katz who reported Betty's death to the authorities and signed her name to the certificate. Amalie also lived in the neighborhood and was Betty's first cousin, the daughter of the brother of Betty's father. They were both born in the Pomeranian city of Kolberg and both had lived in Berlin for many years. Betty had been a widow since 1929 and Amalie had never married. One thing about the death record that jumps out is that both women are listed with the middle name Sara. This is a result of the Nuremburg race law mandating the addition of the given name "Sara" or "Israel" to Jews with unrecognizably Jewish first names. Betty and Amalie were not Jewish-sounding, thus they got the Sara. In my recent work with Danzig marriage records, I have seen many examples of records amended with the notation that the bride has added the name Sara or the groom has added Israel. Though the law dated to 1936, the notated records I have seen show the name being officially assigned in either 1939 or 1941. Betty's marriage record from Kolberg, which I have, is not notated, but she most likely was assigned the Sara name in 1939 or 1941. Notice that Amalie actually puts the Sara first in her signature. Also note the surprising missing details in the form for Betty's parents' names and the details of her previous marriage. These were all facts that Amalie knew well, yet the registrar did not bother to ask her for the information. Does this suggest that the German registry official didn't much care about the details of Jewish deaths by this time in 1942. He did get the exact details of Amalie's address and identity card. After all, she would be getting notice of her coming deportation soon enough. Thankfully, that's a fate that Betty escaped by succumbing to her illness in an illegal Jewish hospital a few months before all old ladies of the Bavarian district were boarded on trains.